Citation: Cottingham, M., Blais, D., Gearity, B., Bogle, K., Zapalac, R. A Qualitative Examination of Latin American Wheelchair Sport Practitioners’ Marketing Practices. Journal of Sport for Development. 2015; 3(5): 11-22. Latin American disability sport programs are an important economic and social component of sport with a strong presence in the Paralympic Games, impressive results at international competitions and growth in domestic programming. Yet current marketing research offers no data that is specific to Latin American disability sport promotion. The purpose of this study was to explore the current strategies of marketing disability sport in Latin American countries and factors that influence these strategies. Nine participants representing disability sport organizations in six countries were interviewed with results transcribed and analyzed using the constant comparative method. Among other findings, results indicated that governmental support varied across Latin American nations as did professional training and the formality of marketing plans, which impacted short and long term organizational goals. General themes such as problematic perceptions of athletes with disabilities, surrounding cultural stereotypes, and level of media involvement also impacted strategic planning and resource acquisition. Research on wheelchair sport marketing has recently gained substantial attention. Primary lines of research in this context include United States collegiate wheelchair basketball players’ perspectives of how they are marketed,1,2 disability sport consumer behaviour studies,3-5 scholars’ perspectives on the need to increase disability sport funding by way of social justice,6,7 the use of hyper-masculine images and violence in United States quad rugby,8,9 and Western disability sport executives’ perspectives on the promotion of their sport.10 While these studies piece together the marketing perspectives of athletes, event promoters, and spectators, they all are homogenous in that they are exclusively focused on United States and European interests. The IPC has supported research on topics as varied as drag for swimmers to nutritional habits of Paralympic athletes.12 These efforts to support and disseminate research have been used to improve opportunities for and performance of athletes with disabilities. However, little data exists on wheelchair sport in Latin America and virtually no research focuses on the promotional efforts of Latin American wheelchair sport. Specifically, understanding successful promotional strategies of wheelchair sport in Latin America and the population’s perceptions of disability may benefit the promotion and ultimately enhance the success of the Paralympic Games. The purpose of this study was to explore Latin American sport practitioners’ marketing practices for wheelchair sport as well as factors which influence those methods. To better understand this contextually, a review of literature on sport marketing in Latin America and wheelchair sport marketing is provided. While existing studies such as Ferreira and Bravo13 have focused on country-specific sports consumption, to date there is little research on sport marketing in Latin America, which is undoubtedly a booming market with new opportunities for commerce, promotion, and sponsorship. Representing a $3.7 billion dollar sponsorship market,14 the region’s growth and influence has reached substantial levels prompting the creation of a Spanish and Latino special edition by the International Journal of Sports Marketing & Sponsorship.15 Recognizing the advantageous industry, Canon U.S.A sponsored Copa America Argentina 2011 as “a unique opportunity to reach the fast-growing Latin American markets.”16 Similarly, the Professional Golf Association recently launched a Latin American tour while major sport marketing firms such as IMG, Octagon, and Wasserman Media Group currently converge towards Brazil with hopes of capitalizing on the 2014 World Cup and the 2016 Olympics. Michael Payne, a former IOC executive explained, “It’s a market unlike the U.K. or U.S., where there’s not a great tradition or heritage of sports marketing expertise, so a lot of the big players are moving in.”17 Bravo, Oreja, Vélez, and Lopez de D’Amico18 note that these markets can be diverse with larger markets focusing on professional sports and smaller markets focusing on tourism and related entities. Sport organizational structures often resemble European designs more than U.S. formats having both Ministers of Sport as well as a publically managed club format.19 Additional governmental regulations can impact private investment (e.g. sponsorship). The relationship between sport and government is all the more challenging due to the relative newness of sport marketing in Latin America. There is a gap in the literature in regard to disability sport in Latin America. Latin American countries accounted for 20 of the 164 nations in the 2012 Paralympic Games in London. Latin American countries also sponsor 14 national basketball teams, 15 international tennis programs and six wheelchair rugby programs. Each of these national teams draws from numerous regional and club teams within their own respective country. If Latin America is to continue to grow and develop competitive wheelchair sport teams, then efforts must be made to identify best practices in the promotion of wheelchair sport in this context. Research Question #1: What are the current marketing practices of the organization? Research Question #2: What are the funding sources of the represented organization? Research Question #3: What media outlets are most supportive of the represented organization? Research Question #4: How is disability perceived in the representative community? As the first study on the marketing practices of Latin American wheelchair sport, an exploratory qualitative research design was used. This design is particularly well-suited when little is known about a topic in order to help the researcher understand the phenomenon without imparting undue bias, and also as an essential step before using other research designs and methods such as (quasi) experimental designs or surveys.30,31 As an exploratory study, research questions were intentionally designed to collect a breadth (rather than depth) of responses across multiple but related topics germane to sport marketing. An Institutional Review Board (IRB) approved the study before data were collected. Purposeful sampling was used to obtain information-rich sources of data.32 The first author contacted the governing bodies of Latin American wheelchair basketball, rugby and tennis to assist with identifying prospects. Subsequently, the 17 identified prospects across the three sports and a range of competitive levels were contacted to voluntarily participate. Nine participants representing six Latin American countries responded and participated in the study, and each provided consent to identify their names and affiliations. At the time of data collection, each participant was an executive within a Latin American wheelchair sport organization. Table 1 shows the name, country, respective sport, and title of each participant. All participants agreed to have their names used in the study, and this disclosure was approved by the IRB. A semi-structured interview was conducted with each participant, allowing the researchers to collect pertinent data and the participants to provide possibly new and interesting responses. Interview questions that were asked were directly related to the research questions.33 Example interview questions included, “What are your current policies on marketing disability sport? How is disability perceived in your culture, and how does that influence marketing your sport?” Due to language differences, special considerations were given to accommodate the participants. Two of the participants affirmed they could conduct the interview comfortably in English, while seven preferred Spanish. The first author conducted the two interviews in English with those participants who felt comfortable with the language. The remaining interviews were conducted by two bilingual interviewers familiar with sport marketing research and qualitative interviews. The first author further trained the bilingual interviewers by showing them transcripts of the English interviews. Then the first author reviewed the first interviews conducted by the bilingual interviewers. This step acted as a peer debriefing session, which helped the interviewers understand how to make possible changes to subsequent interviews, thereby also enhancing trustworthiness. All interviews were conducted over the phone or via Skype, audio recorded, and lasted between 24 to 53 minutes. The interviews in Spanish were transcribed by the respective bilingual interviewer, one of whom also transcribed the English interviews. Data were inductively analyzed using the constant comparative method, which was initially developed for grounded theory but has expanded to use in qualitative studies in general.34,35 This approach is appropriate when no prior theoretical framework is used as the lens to analyze the data or when little is known about the topic, so the researchers can develop an insider (Latin American executives’) understanding of the phenomenon.34 The constant comparative method consists of coding individual transcripts starting with a line-by-line analysis. This study utilized the smallest unit of analysis, called meaning units, as an introductory step to interpret the data. Similar meaning units were further analyzed and grouped within each transcript to develop sub-themes. Finally, sub-themes were grouped across all transcripts to develop themes, and, therefore, answer the research questions. In order to enhance the rigor of this study, three separate researchers individually analyzed each of the nine transcripts. Then, the researchers discussed their analysis in a critical and constructive manner, helping to refine the sub-themes. After a lengthy (approximately 30 hour) analysis process, the researchers agreed upon the final interpretation. Trustworthiness refers to the accuracy and dependability of qualitative research.32 Trustworthiness of this study was enhanced by the use of multiple researchers during the analysis process.36 This step challenges the researchers to clarify and define their interpretations of the themes. Member checking, a procedure in which the participants are given a summary of the findings to modify, dispute or corroborate, was used in order to ensure the researchers’ interpretation was accurate.30 Finally, an external peer debriefer, a trained and experienced qualitative researcher, was used to review the results and by extension, the data analysis. Upon this peer debriefer’s feedback, the results were modestly adjusted (i.e. clarification of the themes’ meaning, word choices to reflect participants’ understanding). Finally, the first author maintained an audit trail of the data analysis and research process in order to provide transparency and accuracy and to enable challenges to the methods at a later date or upon request. Research Question 1: What are the current marketing practices of the organization? Value of marketing. The participants expressed a wide variety of perspectives on the value of marketing wheelchair sport. Some organizations placed a high value on marketing while others focused on the preparation of athletes. The majority of participants understood the importance of marketing; however, implementation was fragmented. We ask for help, in return for what? Well in exchange for advertising, the uniforms. I dictate training for basketball, I’m the coordinator, so I also work with the different sponsoring companies. This is a way to do the publicity, get the posters, reach the population through radio and print sources and television…We are working this way because we really don’t have a concrete structure of how to do it. That’s what we’re doing for now. We don’t have a plan of the term “marketing,” but we’ve done evaluations and we are growing. We continue to make progress and the presentation of all our values, of national events, and with this we go out to different companies to see if we can gain support for our basketball team in a competitive and professional way. So this is what the brands like. They like to appear in the media, they like to be related with a wheelchair event, that is well, in public interest. This is basically the way we win the hearts of the sponsors. The return of the investment is very difficult to measure because we are small countries and we don’t have a marketing department that does studies, and many times the investigation turns out to be much more expensive than the sponsorship. Our greatest allies to develop wheelchair tennis, our greatest fans, let’s say, are traditional tennis players, the regular players. They definitely are the ones that like the event, they know what it’s like to play tennis, they know the effort it takes and they recognize it. Research Question 2: What are the funding sources of the represented organization? A presentation of organizational funding sources is provided below. We categorized these into governmental funding and sponsorship, as none of the participants spoke positively of ticket fees or other forms of revenue. Since it is a developing country, first you have to get support from the public entities because the private entities are much harder. So we go [get] the support from the state, the national government, then from the city of Buenos Aires because it is the capital of Argentina. Three participants stated they did not receive government support. [An event] was a success and we were able to get sponsors that will continue to support us. Some with money, others not with money…Like Radisson, we had a good deal in our last event. They supported us in our activities in hosting people from other regions. Also, transportation. Help transporting people or players who don’t have the means to pay for transportation. We have different types of sponsors. For example, restaurants, prizes… Now, every club has their own sponsors and each manages that. Four participants specifically spoke of difficulties and frustrations with attracting sponsors: “We do not have much collaboration with the private sector- businesses or corporations. No, it’s almost null, their participation,” said Edgard Asprilla. In addition, single participants also noted strategic partnerships, donations, and self- funding. These other funding components are not discussed in depth here nor in the discussion due to the limited frequency but are worthy of notation. Research Question 3: What media outlets are most supportive of the represented organization? The participants were asked to discuss their organization’s ability to employ media. A detailed presentation is provided below. In short, use of the internet was universally hailed as a benefit to all organizations. Print and radio coverage was generally well-received while television was difficult to attain. Finally, direct outreach efforts were also mentioned as beneficial by some participants. I think it’s key because with Internet you can get to a lot of people with no pause at all so it depends on us to create a lot of content video, photos, to show the people who you are, making groups and everything. So if the people like what we are doing…people watch. And television is great! It’s major, everyone watches TV! Imagine that we have an event where we fuse with another event. Let’s say for example we have a tournament Chile vs. Spain and we have Nadal. What does it cost Nadal to give up a few minutes of his time to support and help? Or a message from him saying he supports us. It can be Gonzalez, Nadal, Ferrer…anyone, just someone important… It makes a difference to the businesses that support us. TV coverage it is important but is seen by less people. The people have to watch it at a certain time. On the other hand, print media can be read at any moment and can even be saved for later. So we try to, we have very good relationships with the journalists, we try to be with them in the best way possible, we try to be in good partnership with them, help them, so that they help us in the promotion of events. Direct outreach. Three participants described their approaches to direct outreach, which included staging events, providing brochures and making personal calls to educate both the media and potential spectators. What always works is the radio, internet, written press and television coverage together… but mostly social media helps a lot. And I think a Facebook page and to find us. Everything works together… I can make a phone call [to sponsors] but they have to know I am calling to offer something and not to ask for something and that it will benefit them and their employees [due to media coverage]. An employee can say, yeah my company supports wheelchair tennis, that’s good. What I am more concerned about here is the education of journalists who cover Paralympic sports. Sometimes they do more harm than if they did not cover the sport. When they write an article in a newspaper… saying that perspective about disabilities that are invalid or words that will translate like crippled … they harm the movement more. I think there is a big challenge … educating to the media and the journalist to use proper language and use proper ways to understand disabilities sports as elite sports and not having it as a story of some hero, in a condescending way. Research Question 4: How is disability perceived in the representative community? Inspirational supercrips. All nine of the participants conversed about the supercrip image or the inspirational quality of the athletes. Interestingly, the participants referred to athletes being inspirational almost exclusively as a positive aspect for sport promotion. Juan Juarez explained that being promoted as an inspirational image is an opportunity for disabled athletes or other accomplished disabled persons to stand out or be viewed differently. This presentation of inspiration was also interwoven with independence. Edward Asprilla explained that the public has more admiration for disabled athletes because they are active, and therefore, viewed as independent. In addition, the presentation of the supercrip narrative was seen almost exclusively to combat what was perceived as a more dangerous narrative of the incapable person with a disability. In short, while a stereotype, it was seen as combating a more limiting one. Negative perceptions. Three negative perspectives were identified by at least some of the participants, including the socially undesirable stigma of people with disabilities, their perceived helplessness, and the general and widespread unawareness of society. Honestly the people look at us as distinguishing or different. There are guys that still are tucked away in their houses, hidden, and when they leave their familial nest, the presence or existence of the person is not even acknowledged. That is to say, the treatment of disabled people in our country has much to work on. Helplessness. Four participants believed that society saw athletes with disabilities as helpless. “They think that when you have a disability there isn’t much more you can do with your life,” said Edward Asprilla. Furthermore, three participants revealed that perceptions of helplessness and being unaware and socially undesirable either individually or in concert, led to uncomfortable experiences for potential spectators. According to Miguel Antonio Irigoya, some spectators think that these activities are strange and that the participants are suffering. Irigoya further explained that they are changing this mentality. Look, at first it was something tremendous, right? You see a disabled person and think “cripple, lame.” They are looked on with a lot of pity. In today’s world that’s not the case. We have been finding our place with the disability and already the people are entering a different culture, you know? It’s not anymore like yeah, they’re good for begging and we give them alms. There are people with disabilities who have recovered. And they have placed themselves on a basketball team, many people working in the municipality, guys that are graduating, many that are finishing the majority of high school, so we have been rising. People will say their parents were bad people and they would learn something from this, like a karma way to perceive disability. You also see this in the city, when a rich guy gets a stroke, his friends are going to judge him. The second view is that through sufficient medical intervention, disabled people could be normal. The third view is spearheaded by activists and intellectuals and is based on emerging human rights, since Columbia recently ratified conventional rights for people with disabilities. Salazar compared racism to the way that disabilities are perceived and he explained that racism and disabilities are examples of perceived boundaries rather than tangible limitations. The human rights movement believes that more individual knowledge and personal growth are required to understand disabilities. Salazar further explained that sports help market the human rights message and change perspectives by allowing the public to see these disabled athletes as active and independent individuals, rather than as beggars. Development of cohesive strategies based on established principles. It is clear throughout the data presented that many of the marketers for wheelchair sport in Latin America have limited formalized sport marketing training. These findings mirror statements made by Bravo et al.,18 who noted that marketing strategy in Latin America lacks adequate sophistication and needs improvement in various sport marketing contexts. Furthermore, the wheelchair sport practitioners who were interviewed for this study had a history of sport participation or advocacy work, rather than a marketing history. Therefore, their training may be behind their non- wheelchair sport peers who work in Latin American sport promotion. Given that there is also a wealth of marketing research on the Hispanic/Latino sport consumers in North America, concepts gleaned from these studies could also be helpful in designing targeted strategies for the Latin American disability sport consumers. Harrolle et al.,21 also noted that Hispanic/Latino consumers’ BIRGing, or Basking-In-Reflected-Glory behaviors were excellent predictors of attendance at future games or events. Thus, a wheelchair sport marketer in a Latin American market may use this information to better target consumers riding an emotional high. BIRGing may be applicable in this context for two reasons: first of all, attachment points to disability sport can be quite high4; secondly, inspiration by way of the supercrip image can increase emotional reaction.37 This is where the training becomes critical to the development of effective strategies by making the practitioner aware of these and other empirical results. Thus, Latin American wheelchair sport marketers should be provided and should seek out additional training opportunities that will help them develop comprehensive marketing strategies that realize gains for their respective organization. Variability in marketing investment and sophistication. Levels of sophistication and investment in marketing varied across programs. This is not distinctive in this context, as Doherty, Saker and Smith38 observed differences in public leisure marketing sophistication, and Lynn, Lipp, Akgun and Cortez39 observed organizational differences in online marketing sophistication. The findings of this study are unique in that while education, program size, staff size, leadership differences and program history may influence the investment and sophisticationof a marketing plan, our results suggest that the relationship to able-bodied organizations may be the most significant determining factor in marketing strategy sophistication. Relationship to able-bodied organizations. Of the sports represented in this study, wheelchair tennis was the first to develop partnerships and to integrate into an able-bodied sport’s governing body at an international level.40 Specifically, the International Wheelchair Tennis Federation became part of the International Tennis Federation (ITF). While some autonomy might have been lost, the ITF provided stability to wheelchair tennis, which in turn impacted specific member nations who are required to work through their national able-bodied tennis organization in order to have athletes compete in ITF-sanctioned events. Because of this, national governing bodies for wheelchair tennis are expected to support and promote wheelchair tennis. Similarly, wheelchair rugby governing bodies have recently worked to develop partnerships with their able-bodied counterparts as exemplified by the International Wheelchair Rugby Federation’s efforts to seek collaboration with the International Rugby Board.41 Able- bodied governing entities such as the ITF and IRB have existing resources and strategies in sport marketing; in contrast, wheelchair sport organizations oftentimes do not have the human resources, leadership, or professional training to prioritize marketing. Although wheelchair basketball has an estimated 100,000 players throughout the world41 as well as the potential for growth, the current lack of substantial direct ties to able-bodied organizations provides unique challenges. As previously stated, these governing bodies may retain more autonomy without the affiliation to larger able-bodied organizations but in exchange for conceivably less leverage in promoting wheelchair sport. To date, there is little evidence on how wheelchair sport is funded at the national or local level. Almost no information exists on sponsorship, except a few newspaper articles such as “Sponsorship lift”42 and press releases such as “NEC extends sponsorship,”43 which discuss individual sponsorship contracts but provide no data related to size of the sponsorship contacts. For this reason, this study provides a baseline understanding of how some national level wheelchair sport programs are funded. The results indicate that such funding is primarily a combination of governmental funding, sponsorship acquisition, direct outreach, and in-kind donations. Challenges and barriers. A number of practitioners discussed the negative social perceptions of the disabled such as being helpless and undesirable as well as the general societal ignorance that helped to form those perceptions. However, the majority of the participants expressed that such perspectives were improving, which is supported by research in non-sport contexts explaining that exposure to disability is indeed assisting in changing attitudes.26 There seemed to be an inherent understanding from participants in this study that exposure was beneficial to changing perspectives and therefore gaining support, monetary and otherwise, from the community. Supercrip image. This study is only the second of which to provide evidence of the supercrip image outside the United States, the first being Kama.37 In much Western literature, the inspirational supercrip image is often perceived as negative by theorists,46,48 as well as sport stakeholders.1,37 In contrast, all participants in our study referred to the supercrip image as a positive concept for promotion and disability rights. Cottingham et al.,48 found that the supercrip image may be an effective means to promote disability sport and attract spectators.􏰀With these practitioners, there is a belief that the use of the inspirational sueprcrip may not be perceived as antithetical to disability rights. However, it should be noted that research in American disability sport spectatorship has noted that the supercrip image can attract spectators to attend but does not convert them into fans.47 In short, spectators of wheelchair sport might not be able to truly invest in the outcome and results if they are focused on the athletes overcoming. Because marketing strategy sophistication varied significantly between organizations and sports, we recommend a mentorship program. A review of the International Wheelchair Rugby Federation website noted that countries with more advanced disability sport programs mentored countries with less developed programs. These mentorship efforts include training suggestions, guidance on athlete recruitment and coaching support. We suggest extending this mentorship program to address resource acquisition. In addition, our findings provide evidence that there are several ways for Latin American disability sport programs to acquire resources and recognize that a one-size-fits-all approach is not needed to successfully acquire resources. All participants focused on online mechanisms as effective approaches to promote their programs. Clearly, online promotion is cost effective and allows individuals who support a team or sport to consume at their leisure. Future research should examine who these spectators are and more importantly, if these online efforts attract new spectators or instead simply service existing consumers. The findings related to the supercrip narrative and the participants’ perception of its impact on society. The participants noted their perception of the benefits of this image. However, researchers in America have also noted that the promotion of the supercrip narrative can be negative or at least mixed. Efforts should be made to examine this phenomenon in more depth. As an exploratory qualitative study, this investigation was delimited to nine participants across multiple organizations and countries. Although this study serves as an important first step before more sophisticated research designs can be effectively used, this qualitative study is limited in its depth of findings and generalizability. Future research should continue to understand wheelchair sport marketing, for example, within one competitive level, sport, or country, as well as unique cultural factors. 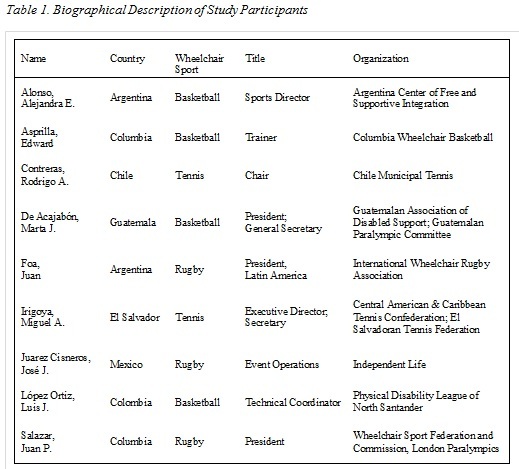 Rather than working from a blank slate approach,31 the results from this study may be of use to researchers seeking to better understand marketing wheelchair sport in Latin America and to develop a theoretical explanation of marketing practices. The finding related to the participants’ positive perception of the supercrip image warrants future research to understand why this was the case and also in related research on the efficacy of the supercrip image as an effective marketing tool for wheelchair sport. Hardin, M., & Hardin, B. (2004). The “supercrip” in sport media: Wheelchair athletes discuss hegemony’s disabled hero. Sociology of Sport Online, 7(1). Hargreaves, J. A., & Hardin, B. (2009). Women wheelchair athletes: Competing against media stereotypes. Disability Studies Quarterly, 29(2). Cottingham, M., Phillips, D., Hall, S. A., Gearity, B., & Carroll, M.S. (2014). Application of the Motivation Scale for Disability Sport Consumption: An Examination of Intended Future Consumption Behavior of Collegiate Wheelchair Basketball Spectators. Journal of Sport Behavior, 37(2), 117-133. Cottingham, M., Chatfield, S., Gearity, B.T., Allen, J.A., & Hall, S.A. (2012). Using points of attachment to analyze the consumption behavior of quad rugby spectators. International Journal of Sport Management, 13(2), 160-172. Evaggelinou, C., & Grekinis, D. (1998). A survey of spectators at the International Stoke Mandeville Wheelchair Games. Adapted Physical Activity Quarterly, 15(1), 25-35. Hums, M., Moorman, A., & Wolff, E. (2003). The inclusion of the Paralympics in the Olympic and amateur sports act: Legal and policy implications for integration of athletes with disabilities into the United States Olympic Committee and national governing bodies. Journal of Sport and Social Issues, 27(3), 261-275. Sylvester, C. (2011). A virtue-based approach to therapeutic recreation practice. Therapeutic Recreation Journal, 43(3). Gard, M., & Fitzgerald, H. (2008). Tackling Murderball: Masculinity, disability and the big screen. Sport, Ethics and Philosophy, 2(2), 126-141. Cottingham, M., Gearity, B.T., & Byon, K. K. (2013). A qualitative examination of disability sport executives’ perceptions of sport promotion and the acquisition of sponsors. Sport Marketing Quarterly, 22(2), 92-100. Ferreira, M., & Bravo, G. (2007). A multilevel model analysis of professional soccer attendance in Chile 1990-2 002. International Journal of Sports Marketing & Sponsorship, 8(3), 254-271. IEG, LLC. (2011) Sponsorship spending: 2010 proves better than expected; Bigger gains set for 2011. Retrieved from http://www.sponsorship.com. Chadwick, S. (2007, April). Spanish success and its influence on sport marketing. International Journal of Sports Marketing & Sponsorship, 8(3), 205. Lefton, T. & Mickle, T. (2011). Marketing firms flock to Brazil. Sports Business Journal, 14(7), 1. Bravo, G., Orejan, J., Vélez, L., & Lopez de D’Amico, R. (2012). Sport in Latin America. International sport management, 99-133. Li, M., MacIntosh, E., & Bravo, G. (2012). International sport management. Human Kinetics. Deaton, D. (2011, June 18). Best ways to show in Latin America. Marketing News, 35(3). 13-14. Harrolle, M., Trail, G., Rodriguez, A., & Jordan, J. (2010). Conative loyalty of Latino and non-Latino professional baseball fans. Journal of Sport Management, 24(4), 456-471. King, B. (2011, July 18). The story behind the numbers. Street & Smith’s Sports Business Journal, 14(13). 1-9. Block, P. (2002). Sexuality, parenthood, and cognitive disability in Brazil. Sexuality and Disability, 20(1), 7-28. Courtis, C. (2002). Disability rights in Latin America and international cooperation. Sw. JL & Trade Am., 9, 109-129.
de Carvalho-Freitas, M. N., & Marques, A. L. (2010). Formas de ver as pessoas com deficiência. Revista de Administração Mackenzie, 11(3) 100-129. Skivington, M. (2011). Disability and adulthood in, Mexico: An ethnographic case study. International Education Journal, (26)3, 45-57. Todaro, A. J. (2005). Library services for people with disabilities in Argentina. New library World, 106(5/6), 253-268. Harada, C. M., Parker, R.C., & Siperstein, G.N. (2008). A Comprehensive Study of Special Olympics Programs in Latin America: Findings from Argentina, Brazil, and Peru. University of Massachusetts, Boston. Maxwell, J. A. (1996). Qualitative research design: An interactive approach. Thousand Oaks, CA: Sage. Patton, M. Q. (2002). Qualitative research & evaluation methods (3rd ed.). Thousand Oaks: Sage. Anfara Jr., V. A., Brown, K. M., & Mangione, T. L. (2002). Qualitative analysis on stage: Making the research process more public. Educational Researcher, 31, 28-38. Lincoln, Y., & Guba, E. G. (1985). Naturalistic inquiry. Newbury Park, CA: Sage.and disability in wheelchair rugby. Western Journal of Communication, 72(2), 107-125. Kama, A. (2004). Supercrips versus the pitiful handicapped: Reception of disabling images by disabled audience members. Communications, 29(4), 447-466. Doherty, N., Saker, J., & Smith, I. (1998). Developing “appropriate” marketing within the public leisure and library sectors: A comparative study. Managing Leisure, 3(3), 149-161. Lynn, G. S., Lipp, S. M., Akgün, A. E., & Cortez, A. (2002). Factors impacting the adoption and effectiveness of the world wide web in marketing. Industrial Marketing Management, 31(1), 35-49. Bunting, S., & de Lange, E. (2001). More than tennis: The first 25 years of wheelchair tennis. London: Premium Press. Woolf, J., Heere, B., & Walker, M. (2013). Do charity sport events function as “Brandfests” in the development of brand community. Journal of Sport Management, 27(2), 95-107. Pappous, A., Marcellini, A., & de Léséleuc, E. (2011). From Sydney to Beijing: The evolution of the photographic coverage of Paralympic Games in five European countries. Sport in Society, 14(03), 345-354. Silva, C. F., & Howe, P. D. (2012). The (In) validity of Supercrip representation of Paralympian athletes. Journal of Sport & Social Issues, 36(2), 174-194. Cottingham, M., Byon, K. K., Chatfield, C., & Carroll, M. (2013). Examining the influences of relationship to disability on wheelchair basketball spectators. Disability Studies Quarterly, 33(3). Englandkennedy, E. (2008). Media representations of attention deficit disorder: Portrayals of cultural skepticism in popular media. The Journal of Popular Culture, 41(1), 91-117. Cottingham, M., Carroll, M., Phillips, D. Karadakis, K., Gearity, B.T. & Drane, D. (2014). Development and validation of the motivation scale for disability sport consumption. Sport Management Review, 17(1), 49-64.